Martian Top Ten Favorite Single Comics Issues! With a brain-stunning 82 giant size pages by King Kirby, Marvel’s Treasury Edition format brings the most cerebrally cosmic epic of all time to the world of sequential illustration. It’s bigger than big, huger than huge, and Paul should like it because he has a monkey obsession! (Okay – GORILLA obsession…) This book won’t fit on our scanner, but you won’t regret buying it sight unseen. You might also enjoy the first issue of the ongoing Space Odyssey series Jack launched after this: READ MORE. We have the collected TPB but that bad boy won’t fit on the scanner either – not without trashing the binding. We like #6 the best because it features an amazingly rendered dragonfly, and we like dragonflies a lot. It also has an interesting theme about the dragonfly’s masterful adaptation as a top predator in the insect world, versus his relative insignificance on the macro level of the dinosaurs. His struggle in the sap of a tree is epic in scale, though tiny in comparison – which may say something about our own lives. Brilliant! Here’s a dragonfly drawing Jim Lawson made for his wife. UPDATE: Since our original posting, Jim has made his archive of Paleo comics available at http://paleo.jimlawsonart.com/. Special thanks to Colin and Jim for help completing our Paleo collection in single issue form! Alien Legion Vol. 2 #13 by Dixon and Stroman. An empathic alien soldier psychically bonds with a giant alien whale in a desperate bid to bring his crew home alive. He feels the creature’s pain and fear, and also the immensity of his millenia-long existence. We love the theme of connecting to the indescribably entertwined joy and sadness of nature and her creatures. The poetry is both verbal and visual, and we rarely make it through a reading without getting a little misty-eyed. 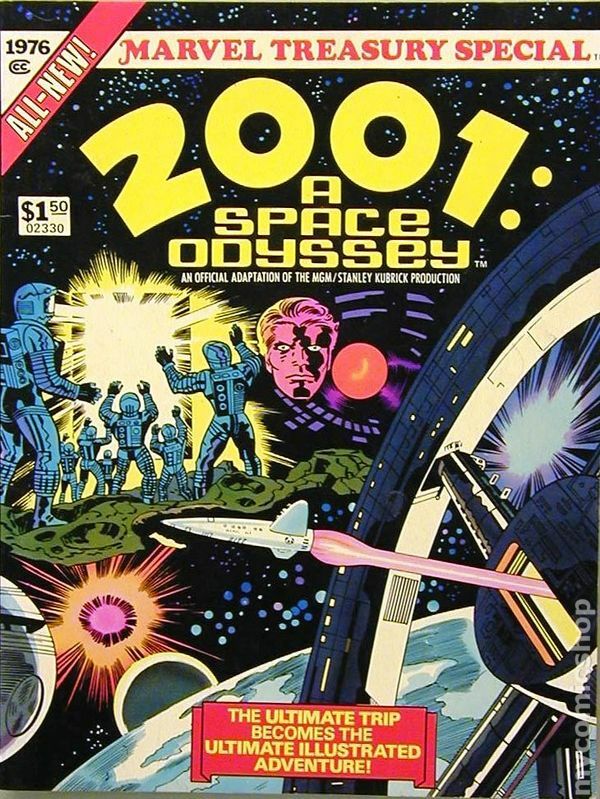 Truly an apex of science-fiction comics as art. READ IT. You know Age of Reptiles is one of our favorite series of all time, and this issue stands out in particular. Just as Lawson’s epic dragonfly in Paleo shows nature on different scales, Delgado’s mighty dinosaurs become small and fragile in the face of incredible natural forces. Here, in splash page after wordless splash page, a giant flood brings total disaster to a valley of dinosaurs caught in the deluge. But even then, to some predators, it is less a tragedy than an opportunity. A brilliant visual poem about dinosaurs, life, and nature. By now you’re thinking we’re nature-loving hippies, and this pick won’t convince you otherwise. If only Ralph Waldo Emerson had lived to see this comic… Taking a break from the horror theme of the series, Moore scripts a passionate poem about life, love, and the unity of all beings and all forces. As Swamp Thing and his human companion declare their love for each other, they consummate through a psychedelic trip where they see the boundaries between them and the world dissolve like the illusions they are. They renew their spirits with a unified vision of the biosphere gorgeously rendered by the artists. READ IT. 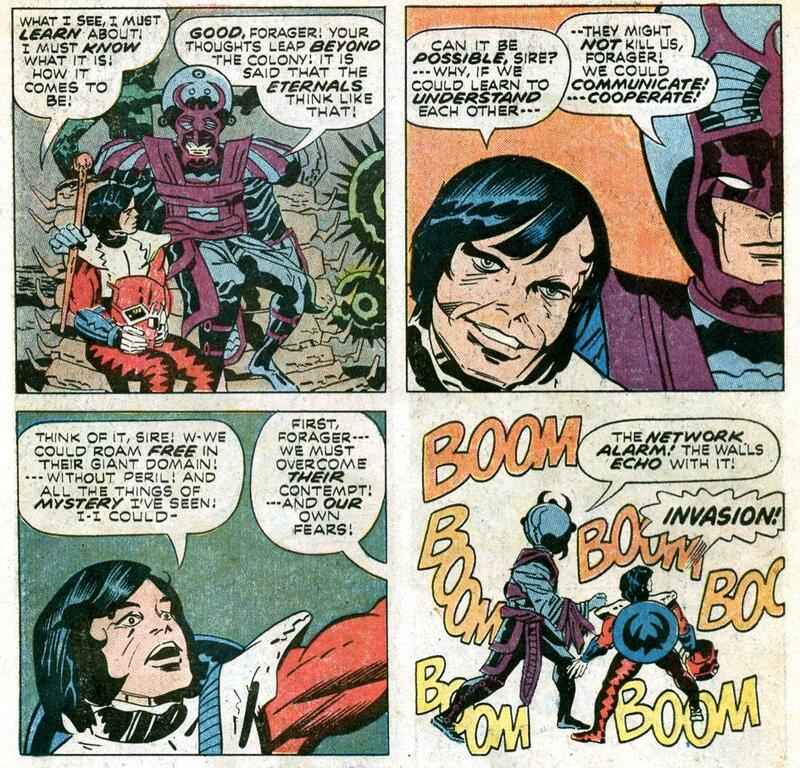 Jack Kirby scores on our Top Ten a second time with… The Bug! Although he has a human face under his mask, The Bug is filled with love for his fellow beings – even if they would cast him out for being different. Although an outsider, he believes that everyone can get along if they just try to understand each other as equals. Kirby crafts in a few short pages an appeal to seeing humanity as one, rather than dividing along lines of race, religion, and all the other ways we convince ourselves that other people are different from us. Pretty heady stuff for an adventure cartoon! READ MORE. This origin of Starfire narrowly edges out the intense story of Cyborg from issue one of this mini-series. Cyborg is one of our favorites, but Koriand’r is an alien princess who flies, shoots star bolts, and takes to battle as passionately as she takes to love. Here we get the painful story of her childhood and how she was sold into slavery and torture and eventually gained her power. Her ascent from the lowest depths of suffering to a transformed near-goddess always inspires us. READ IT. Bissette makes our Top Ten list twice, scoring this time with a marvelously drawn and researched development of a fetal Tyrannosaurus Rex. At once entertaining, poetic, and biologically educational, this issue takes you from a single cell to a fully developed dinosaur ready to hatch and conquer the earth. Mom once asked us why we love comic books, and this is the first thing that came to mind. It isn’t all about dorks in tights punching each other. Comics can convey very sophisticated information about our world in a way that is worth a stack of college text books on the subject. READ MORE. Speaking of dorks in tights, this remains our favorite superhero mega-event to this day. Why? Dr. Doom takes on God – and wins! Through sheer will power, technological prowess, and force of character, he achieves what would be inconceivable to anyone else. “What is pain to one such as I? …Pain is for lesser men! I am Doom!” There’s a million reasons to not make a role model out of Dr. Doom, but he’s been our hero ever since this monumental issue. We also like the graphic novel “Triumph and Torment” by Stern and Mignola, where he and Dr. Strange take on Satan – and win! Doom rules! Where’s our one-way ticket to Latveria?! READ MORE. It’s hard to pick just one issue of Dreadstar or the Metamorphosis Odyssey as our favorite, but issue #4 has 2 pages that chalk up a victory here. 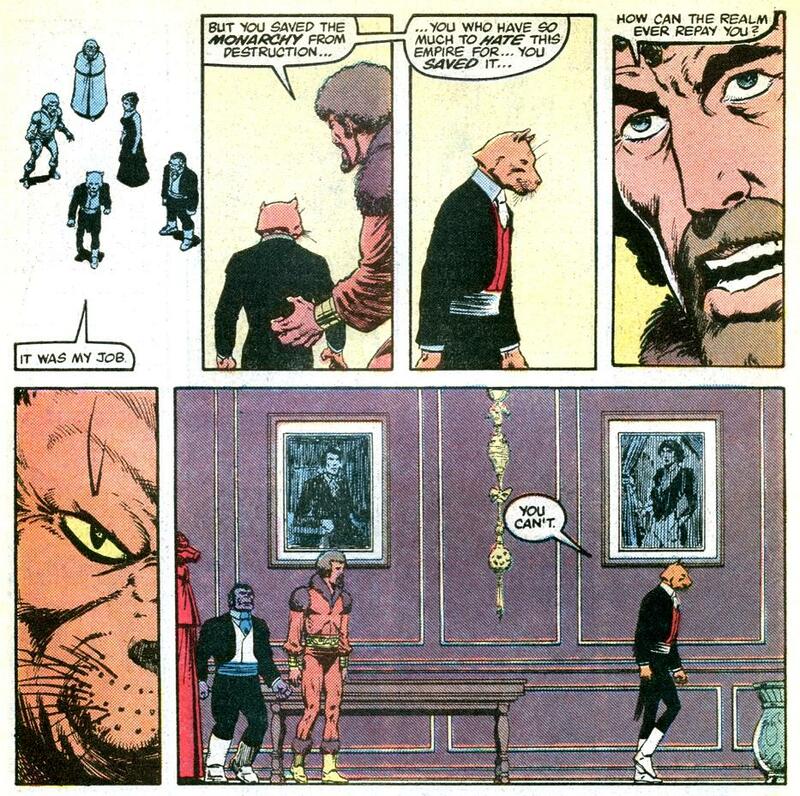 Perhaps you need to read Dreadstar #1 to really understand the background of Oedi the Catman and “get” this scene. 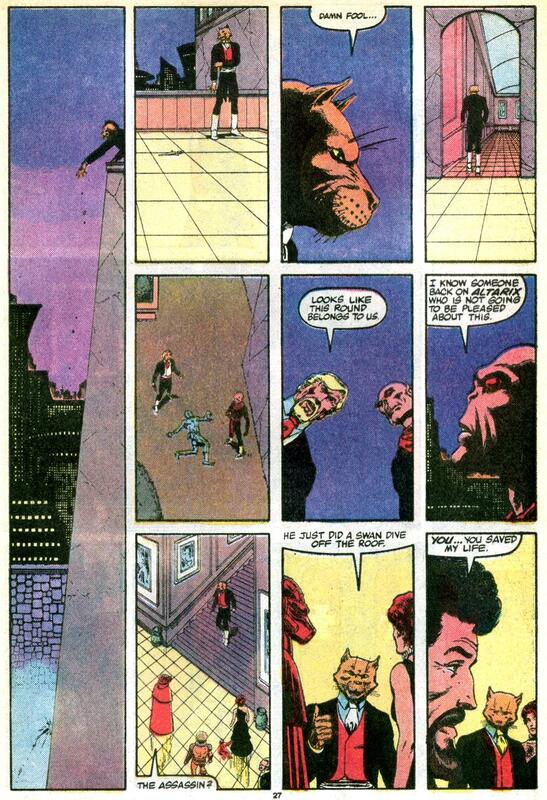 Dreadstar and his crew, including Oedi, are trying to end a galactic war that kills millions of people each year. Here, they must defend the life of a king – a king whose dynasty killed every last one of Oedi’s race. 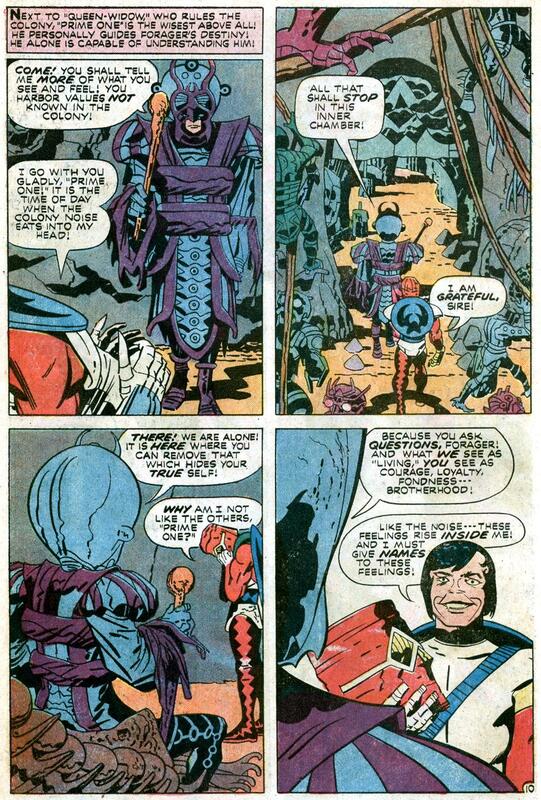 When Oedi saves the day by sending the assassin to his death, the king asks how the monarchy can possibly repay him. Oedi’s response always sends a chill right down our spine, no matter how many times we read it. Nexus didn’t make this list because, well, we’d have to include all of the first 50 issues of Nexus, and that wouldn’t make much of a Top Ten! But we are going to get around that by mentioning our Secret Origin page, where you’ll find out how much we love Nexus #44 – and why this overly enthusiastic fan blog takes its name from that awesome issue. Anyway, this entire site is about our favorite comics of all time – just keep coming back for more, Martians! We’d love to hear YOUR all-time favorites, so drop us a line sometime. Wow, Mars, some artistic choices here … I don’t think I’ve read but two or three of these issues. I will have to revisit my back issue check list and track some of these down. That Alien Legion tale looks especially promising. And, yes, you are right, everything goes better with monkeys or gorillas but I don’t yet know if my own Top Issues List will feature a primate (though I can guarantee it will be longer than your list on dorks in tights punching each other, that’s my bread and butter!). I was waiting to see your list before I got started on my own, to avoid duplication, but aside from Swamp Thing and that Kirby New Gods I don’t think we would have crossed over at all, so I’ll have ten fresh stories for you to consider when I publish over at Longbox Graveyard in two weeks. We like both volumes of Alien Legion, even if the first volume takes a little while to build up momentum. You can easily score individual back issues; the first volume is collected in two Omnibus editions that include the graphic novel; the second volume is collected in two TPBs. Anyone who’s on the fence about Dreadstar can pick up the 6 “Dreadstar and Company” issues that reprint the first six ‘baxter’ issues. You can get them for about a buck a piece. That’s where we started back in the 1980s and it’s a good way to see if you’re hooked on the series or not. Because I am a long-winded Irishman, I’ve limited myself to five selections for this column, with five more to follow in a week or two! Great piece for your collection. Thanks for posting, Jonathan!